Videoslots is fast becoming a leading brand in the world of online casinos. Ever since it’s launch back in spring 2011 the Swedish founders had one goal in mind and that was to make Videoslots the N*1 online casino. 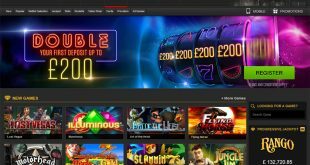 You’ll see this after you join them, to date Videoslots Casino have over 1700 games and rising from the worlds leading gaming houses like, NetEnt, Microgaming QuickFire, Williams Interactive, GamesOS, Play´n GO, NYX, Betsoft Gaming, Yggdrasil, and more. All these games can be played directly in your PC or mobile browser without any hassle or need to download. Videoslots are apart of and leading the next generation of online casinos. The Swedish founders knew that to lead in this maket they had to build an online casino from the ground up rather that taking on another Playtech or Micromedia clone, not that there’s anything wrong with them types of casinos but we all know these casinos can’t list some of the amazing new titles from the likes of Thunderkick or NetEnt. You can’t go wrong joining Videoslots, they have great promotion and all the best games that will play on your iPhones, Samsungs, iPads and even your good old Windows PC. Make your first deposit and receive £10 free cash. 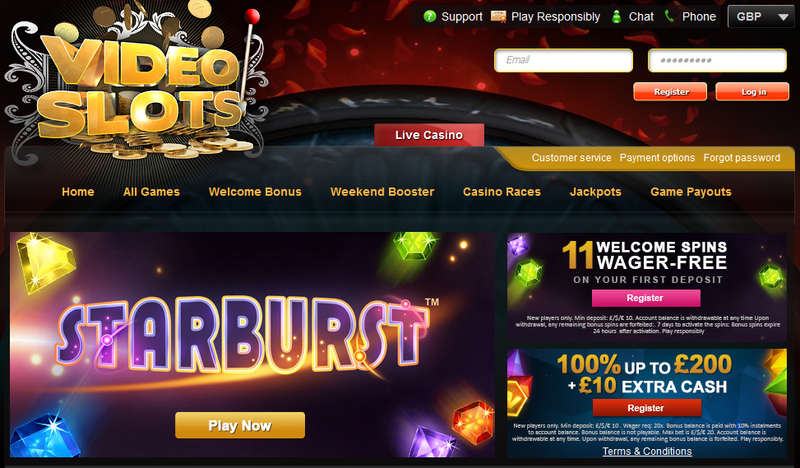 VideoSlots will give you a 100% deposit bonus up to £200 on your first deposit! This bonus is available for activation immediately after you have made your first deposit. You must go to “My Profile” -> “My Bonuses” to activate this bonus. Sign-up and get 11 Welcome Spins after your first deposit! Open your account today at Videoslots.com and be rewarded with 11 welcome spins after you make your first deposit. The welcome spins can be used in the game Starburst. Your extra welcome spins is automatically added to your account after your registration and first deposit has been completed. 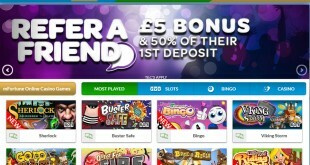 The Weekend Booster – Win up to £ 300 per day! 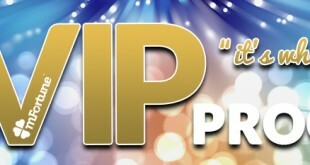 At Videoslots.com we like to reward all our players, so every Friday we accumulate all the spins you would have made during the previous week on our slots and video slots (excluding jackpot games) and pay you a guaranteed win we call the Weekend Booster. The Weekend Booster is based on the total amount of bets made during the week and the RTP’s of the specific games you have played. How much will you win? It’s easy, the more you bet throughout the week, the more you get in Weekend Booster on Friday! You accumulate daily Weekend Boosters that are paid out to you on a weekly basis based on all the bets you place on Video Slots and Slots games. The Weekend Booster is paid out every Friday one week in arrears. So if you happen to be playing during week 40, your Weekend Booster will be paid out on Friday of week 41. You can keep track of your account activity anytime you like. Simply go to My Account >My Weekend Booster. The Weekend Booster statistics are updated once per day. You need to have made at least one deposit in order to receive Weekend Booster payments. Weekend Booster cannot be combined with any other bonus or promotion. If you activate or have an activated bonus, no Weekend Booster can be earned until completion or failure of the active bonus or promotion. Bets on progressive video slots or progressive slots games do not accumulate Weekend Booster. Minimum Weekend Booster payout is £ 0.5. Maximum Weekend Booster payout in one day (00:00 – 23:59 GMT) is limited to £ 300. Weekend Booster is calculated on theoretical RTP minus operating costs (50%) multiply 25%. Weekend Booster payments will be paid out every Friday, one week in arrears. Videoslots.com reserves the right to withdraw any wrong paid Weekend Booster and to change or end this promotion at any given time. No telephone or email address found on the Videoslots website but they offer a free call back service, online live chat support and an email contact form. Visit the contact page on the main site.